Taipei, Taiwan, June 19, 2014 – QNAP® Systems, Inc. today announced the release of the IS-400 Pro Turbo NAS – a robust all-in-one industrial, 2.5” SSD/hard drive compatible four-bay NAS designed for reliable operation. Reacting to the growing demand for networked storage in factories, warehouses, vehicles, shop floors and other non-office settings, QNAP’s new IS-400 Pro – built with a rock-solid fanless design – represents the ideal choice for organizations looking for a dependable NAS and surveillance solution with high performance, durability with persistent throughput. Non-office settings require a NAS designed to operate perfectly across varying temperatures, environments and conditions. “The IS-400 Pro is fanless and built with high-quality aluminum materials to maximize heat dissipation, ensuring reliable operations between -25°C and 50°C (-13°F to 120°F) when used with industrial-grade SSDs,” said Jason Hsu, product manager of QNAP. Encased within a rugged steel body and designed to withstand rust, vibration and impact, “the IS-400 Pro, with a dual-core 1.1 GHz Intel® Celeron® Processor and 2GB DDR3 RAM, provides the power to run day-to-day tasks and with link aggregation users can enjoy speeds of up to 221MB/s read and 214MB/s write,” added Hsu. The IS-400 Pro is also compliant with the military-grade MIL-STD-810G-514.6E-1 simulation test for anti-vibration, and is able to withstand impact while still providing continuous operation. In addition to delivering the durability and processing power needed to thrive in a wide variety of non-office environments, the Surveillance Station provides a comprehensive surveillance solution for 24/7 security. Users can easily build a surveillance center with the IS-400 Pro by using the Surveillance Station for real-time monitoring, video and audio recording and playback. The IS-400 Pro provides high compatibility with over 2,600 IP cameras of famous brands and also AXIS® Camera Companion, the video management software (VMS) for AXIS network cameras, to offer a reliable and powerful network surveillance system. Being compatible with major virtualization solutions in the market, the IS-400 Pro is a reliable storage unit for server virtualization. It supports VMware® vSphere™ 5.1 and Citrix® XenServer™, and is compatible with Microsoft® Hyper-V™ and Windows Server 2012. The support for VMware VAAI, QNAP vSphere Client plug-in, Microsoft ODX, and QNAP SMI-S provider further enhances the efficiency of operating and managing virtualization applications. QNAP NetBak Replicator supports real-time and scheduled data backup on Windows including Outlook email archiving. Apple Time Machine is also supported to provide Mac OS X users with an effortless solution to back up data to the IS-400 Pro. A wide range of third-party backup software such as Acronis® True Image and Symantec® Backup Exec are also supported. The IS-400 Pro offers various data recovery options. RTRR (Real-Time Remote Replication) supports real time or scheduled data backup to remote Turbo NAS or FTP servers and synchronizes files to remote folders from local folders with better backup efficiency and reduced backup time. The IS-400 Pro also supports rsync protocol to back up data to remote servers on a scheduled basis. Data can also be backed up to and restored from a range of cloud storage services, including Amazon® S3, Amazon Glacier, Microsoft® Azure, ElephantDrive®, Symform®, Dropbox® and Google® Drive. The new IS-400 Pro is now available. For more information on the IS-400 Pro and the full QNAP Turbo NAS lineup, including where to buy, please visit www.qnap.com. About QNAP Systems, Inc.QNAP Systems, Inc., as its brand promise "Quality Network Appliance Provider", aims to deliver comprehensive offerings of cutting edge network attached storage (NAS) and network video recorder (NVR) solutions featured with ease-of-use, robust operation, large storage capacity, and trustworthy reliability. 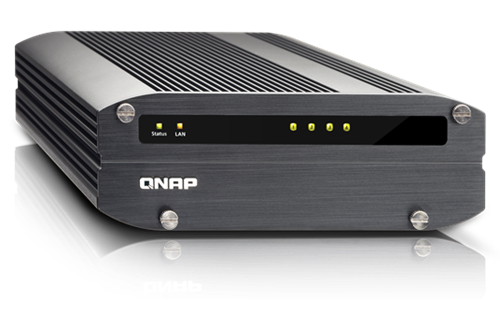 QNAP integrates technologies and designs to bring forth quality products that effectively improve business efficiency on file sharing, virtualization applications, storage management and surveillance in the business environments, as well as enrich entertainment life for home users with the offering of a fun multimedia center experience. Headquartered in Taipei, QNAP delivers its solutions to the global market with nonstop innovation and passion.